The HW97K is related to one of the first - and finest - underlever field target air rifles ever made. Coming from the famed plant in Germany, it's proving to be just as accurate. 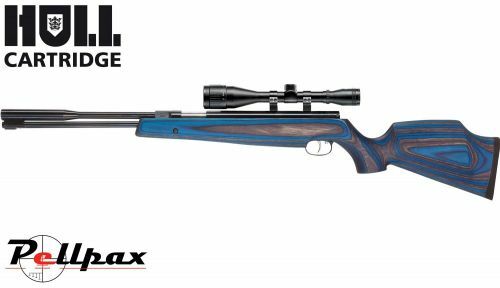 Even if you're not a field target enthusiast, you'll enjoy shooting this rifle! It's great for metallic silhouettes, plinking, shooting spinners and paper targets, and accurate enough to do some serious hunting. The quality of the polishing and bluing on the steel action, barrel and underlever exceeds what you'd normally find on comparably priced firearms. The blue laminated stock has a raised RH cheekpiece on the Monte Carlo buttstock. The stock is capped with a soft rubber recoil pad to give you ultimate control. The gold Rekord trigger, which is praised by shooters and admired by competitors, adjusts to your needs. The 11mm grooves in the receiver make it easy to mount a scope (it does not come with open sights). If you like the simplicity and ease of shooting a spring-piston gun, then give the HW97K serious consideration.